Many countries in sub-Saharan Africa are keen to develop their rice sector — the continent imported 12 million tonnes of rice in 2012 alone, costing US$ 5 billion. I travelled to Côte d’Ivoire some months ago, and it is clear that this country is no exception. I first paid a visit to the AfricaRice research facility in M’bé, near the town of Bouaké. These 700 ha grounds were abandoned in 2002 because of the civil war. A handful of extremely dedicated staff were able to maintain the infrastructure in excellent shape throughout the conflict. Offices and laboratories are generally empty but have been kept clean. Posters in the hallways reflect research done more than a decade ago. All the calendars are stuck on the month of September 2002; AfricaRice staff were evacuated from Bouaké on 26 September 2002. Time has really stood still here. Fast-forward to 2013: more than 10 years later we are finally able to re-use our facility, at the moment mainly for foundation seed production — the demand for rice seed in Côte d’Ivoire is enormous. In 2012, we produced 124 tonnes of foundation seed of four popular varieties (WITA 9, WAB 56-50, WAB 638-1 and NERICA 1) and that was as much as we could do. Slowly we hope to re-start research activities at M’bé profiting from the fact that all the main rice-growing environments — upland, rainfed lowland and irrigated — are present within the 700 ha experimental farm. In Abidjan on the way back our regional representative in Côte d’Ivoire, Amadou Bèye, organized a meeting with high-ranking officials of the Ministry of Agriculture and the Ministry of Higher Education and Scientific Research to look into the rice future. The meeting was attended, among others, by the directors general and support staff of Direction générale des productions et de la sécurité alimentaire (DGSPA), Office national pour le développement de la riziculture (ONDR), Fonds Interprofessionnel pour la Recherche et le Conseil Agricoles (FIRCA), Agence nationale d’appui au développement rural (ANADER), Centre national de recherche agronomique (CNRA) and the director general of scientific research and technological innovation of the Ministry of Higher Education and Scientific Research (who chaired the meeting) and representatives of the University Félix Houphouët-Boigny. What emerged from the meeting is the highly ambitious objective of the Ivorian government to increase annual production to 1.9 million tonnes of milled rice of good quality by 2016, and 2.1 million tonnes of milled rice by 2018. At the projected 2018 level, the country would be able to start exporting rice. Rice development in the country is steered by an umbrella organization for the development of the rice sector, ONDR, headed by someone with a lot of private-sector experience, Mr Yacouba Dembélé. ONDR has two main emphases: (1) technical support to rice production, and (2) technical support to value addition. Axis 1 comprises seed production, water management, mechanization of production and postharvest practices, improved crop management practices, and accompanying research and development activities. Axis 2 comprises marketing and labeling (‘Riz Côte d’Ivoire’), development of private-sector involvement, public–private partnerships, support to rice processing, and support to marketing of locally produced rice. ONDR has divided Côte d’Ivoire into ‘rice pools’ of about 70 km2 each in the major rice-producing zones. The leader of each ‘pool’ is a rice processing unit operator. Funding for inputs (including seed) and purchase of paddy is channeled to farmers through these processing units. Rice millers steer the demand for seed and other inputs and pool paddy production. A combination of mini rice mills and medium-sized rice mills will be instrumental in pooling paddy rice from farmers. A total of 48 ‘pools’ have been identified with an average capacity of 37,500 tonnes of milled rice, giving a total of 1.8 Mt of milled rice. These ‘pools’ are distributed over 10 zones, each zone producing an average of 0.18 Mt of milled rice. The financing of the operators of ‘pools’ is done through banks, such as the West African Development Bank (BOAD) and the African Development Bank (AfDB). The performance of the ‘pools’ is monitored by ONDR agents, who are not involved in extension (which is left to ANADER); ONDR only monitors what is going on. The estimated budget to realize these ambitions is about 477 billion FCFA (about US$ 1 billion), with funding coming from the private sector (64%), development partners (22%) and the state (14%). Mr Dembélé highlighted the problem of lack of information with respect to rice knowledge and technology, in particular seed availability, and is keen to collaborate with AfricaRice and CNRA in that area. The ‘pool’ approach is currently being tested with three rice mills in Gagnoa. The first results are very promising: these three mills have established contracts with farmers who deliver paddy with the help of ANADER, and contractual arrangements are being established between millers and farmers. An agreement on paddy price has been reached for the 2013 growing season and accepted by all rice farmers and millers in the entire Gagnoa region. Mr Dembélé will talk about these exciting developments during the upcoming Third Africa Rice Congress in Yaoundé, Cameroon, scheduled for 21–24 October 2013. He left our meeting early to negotiate the purchase of rice mills with a capacity of 5 t per hour from India. Recently I visited Sierra Leone to discuss with the AfricaRice country coordinator based there (Bert Meertens) and our partners, in particular Dr Alfred Dixon from the Sierra Leone Agricultural Research Institute (SLARI). It is quite an adventure to visit Sierra Leone. Once you arrive at Lungi airport you still need to cross the Sierra Leone River. This time I took a speed boat (the alternative is a vintage Russian helicopter or you travel for a few hours by car over land) and arrived late at night at the other side of the river in Freetown. The next day I met with representatives from SLARI and the World Bank-funded West Africa Agricultural Productivity Program (WAAPP) project in an office in the very crowded center of town. Freetown gives the impression of being a bit suffocated — the possibilities to expand the city are apparently hampered by the surrounding lush green mountains. Activities in most of these hubs have started and currently involve identification of bottlenecks and opportunities across the rice value chain and testing of ‘good agricultural practices’ with farmers. Next to concentrating research efforts in Hubs and proactively connecting with development partners from both public and private sectors, those who met generally felt that adoption pathways for research products need to be ‘anticipated’ as early as possible. For example, AfricaRice is about to finalize upgrading the NERICA-L 19 variety (very popular in Sierra Leone) with the sub-1 gene, which will make it flood tolerant in the early growth stages. Varieties upgraded with the sub-1 gene are already cultivated widely in Asia. The work on upgrading NERICA-L 19 and other popular African varieties is done in collaboration with the International Rice Research Institute (IRRI) within the framework of the Stress Tolerant Rice for Poor Farmers in Africa and South Asia (STRASA) project funded by the Bill & Melinda Gates Foundation. For Sierra Leone and neighboring countries there is a need to identify target areas for sub-1-upgraded varieties (e.g. using remote-sensing tools as has been done in Asia), clarify varietal release procedures and identify seed-multiplication partners. In the afternoon we left for the SLARI research station in Rokupr, a small town in Northern Province, near the border of Guinea. The station is right in the middle of vast stretches of mangroves, inland-valley swamps and bolilands (seasonal swamps flooded for 2–4 months each year). It was established in 1934 as a rice experimental station and is being revamped after having suffered terribly in the civil war. It is still truly a beautiful campus with lots of potential, but, it must be said, very remote. It is a good 4 hours drive from Freetown. We saw many young faces, evidence that the recruitment wave of SLARI is paying off. These young people are currently being integrated into the rice research teams. Laboratories are generally well equipped, but mostly non-functional because of untrained staff, overly complex equipment, missing spare parts, and lack of electricity (available only 7 hours a day). There were many opportunities during this trip to discuss Sierra Leone’s approach to rice sector development. Whereas Côte d’Ivoire seems to prefer a model heavily reliant on foreign investment (see my previous blog), Sierra Leone is taking farmer organizations as the entry point. Dr Dixon explained that these farmer organizations have often profited from knowledge gained in ‘farmer field schools’, facilitated by the Food and Agriculture Organization of the United Nations (FAO). They are now being grouped into ‘Agricultural Business Centers’ (ABCs) to commercialize agricultural products, including rice, in the framework of the Smallholder Commercialization Program established by the government. Almost 200 ABCs have now been established, out of a planned total of 600, and a lot of them produce lowland rice. They have been equipped with a standard set of infrastructure, such as mills, threshers and storage areas. The government is also helping farmers with rice commercialization by buying up rice during harvest and duty-free import of agricultural inputs. There is talk about establishing a national grain reserve to hold excess rice and manipulate rice flow for rice price adjustment when needed. ABCs are currently being ranked in terms of functionality by the Ministry of Agriculture, Forestry and Food Security. Rice is clearly becoming serious business in Sierra Leone with farmer groups moving into the processing and marketing parts of the value chain. The honorable Minister of Agriculture, Forestry and Food Security, Mr Joseph Sam Sesay of Sierra Leone will be present at the upcoming Africa Rice Congress in Cameroon (21–24 October 2013) and will surely provide more insight in his country’s effort to boost the rice sector. Forty rice breeders from 27 African countries and from AfricaRice and the International Rice Research Institute (IRRI) met a few weeks ago in Kampala, Uganda to discuss progress made in evaluating elite rice lines across the African continent and to identify potential ‘champions’ that can make a difference to the lives of Africa’s rice producers and consumers. The meeting was organized from April 15-19, 2013 by AfricaRice in collaboration with the National Agricultural Research Organization (NARO) and the National Crops Resources Research Institute (NACCRI), Uganda. Africa’s rice producers and consumers are facing a huge challenge: rice in Africa is grown in a bewildering diversity of growing environments, from the salty delta of the Senegal River to the windy highlands of Madagascar. Farmers often face large variability in soil and water availability within their fields and a range of biotic and abiotic stresses. There are also differences in terms of consumer preferences for rice, both between and within countries. To make matters worse, training and recruitment of rice breeders has been neglected across the continent since the 1990s. Despite the difficulties, AfricaRice and partners have contributed to the release or adoption of a large number of rice varieties over the last decades. However, many rice farmers do not have access to new varieties that are better adapted to their growing environment and likely to sell well. This is certainly partly due to slow or non-existent varietal release procedures or non-functional seed systems in many African countries. However, there is also an urgent need to adopt a more systematic approach to rice breeding across the continent. It is for those reasons that AfricaRice established, with support from the Government of Japan, a continent-wide Rice Breeding Task Force in 2010, with the explicit goal to accelerate rice varietal development through continent-wide varietal evaluation of nominated elite lines from AfricaRice and international and national partners. The meeting in Kampala was the fourth annual meeting of the Task Force. As of April 2013, the Task Force counts breeders from 30 African countries and from AfricaRice, IRRI and Cirad, all partners in the Global Rice Science Partnership (GRiSP). The Task Force uses a systematic, product-oriented and multi-environment testing (MET) approach involving a series of three consecutive trials with clear protocols and objectives. An overview of experimental sites of the Task Force is shown in the map (Figure 1). Data collected at these sites are analyzed by breeders from the various countries and centrally at AfricaRice, enabling comprehensive genotype-by-environment (G×E) analyses. Farmers, millers, traders and other stakeholders participate in the trials. Members of national varietal release committees attend as well. The ultimate decision to nominate a particular variety for release in a country is made by the country’s rice breeder involved in the Task Force, based on evaluation of all data acquired before and during the MET phase. Rice breeding lines are usually distinguished by a code linked to an experimental station, followed by numbers that refer to a particular cross. For example the well-known Sahel108 variety in Senegal is a variety developed at IRRI with the breeding code: IR 13240-108-2-2-3 and selected by AfricaRice and partners in Senegal. Breeding codes are really too long to remember and AfricaRice and partners have decided to assign new names to particularly promising breeding lines that result from Task Force activities: ARICAs, which stands for ‘Advanced RICes for Africa’. ARICA varieties can be considered as the next generation of rice varieties for Africa, after the success of the ‘NEw RICes for Africa’ (NERICAs) developed in the 1990s and the first decade of this century. An estimated 800,000 hectares of NERICA varieties are currently grown across Africa. For a breeding line to be nominated as an ARICA line it must have a clear advantage over the best check varieties in a region, backed by quality data over at least 3 seasons. Moreover at least one country should show interest in nominating the line for varietal release. The ultimate decision on naming an ARICA line is taken by AfricaRice, and is based on data gathered in the Task Force trials, and any other data gathered during the breeding process. During the Kampala meeting five nominations for ARICA naming were examined by the Task Force and after intense discussions they were all accepted to become the first ARICA lines. ARICA1, 2 and 3 are suited for the rainfed lowland growth environment and are proposed for varietal release in Mali (ARICA1, ARICA2 and ARICA3) and Nigeria (ARICA2 and ARICA3). ARICA4 and ARICA5 are suited for the upland growth environment and have just been released in Uganda. All ARICAs out-yielded local checks including NERICAL-19 in the rainfed lowland environment and NERICA4 in the upland environment. In addition, ARICA3 has better grain quality, higher milling recovery, lower chalkiness and shorter cooking time than NERICAL-19. Additional data about the performance of these ARICA lines will be gathered through the Task Force, allowing the ‘passport data’ of these lines to be updated over time. Through the Task Force, new ARICA lines will become available, backed by solid data. Unlike the NERICA varieties, they are not restricted to interspecific crosses. Any line that shows promise, regardless of its origin can become an ARICA line as long as the data that are collected are convincing. Of course the long and complex breeding codes are known for each ARICA line and the origin and pedigree of any ARICA line can, therefore, be easily traced. Finding champions among breeding lines will always remain time consuming, but through the Task Force at least a very systematic, product-oriented approach is used that is already increasing the efficiency and efficacy of breeding efforts across the continent. However, for all of this to really succeed rice breeders should not only select lines but also use them as parent material to make crosses to develop lines that are really tailored to the needs of farmers and consumers in their country. Each region, country or market niche will have specific requirements in terms of traits that ideally need to be incorporated in a new variety. To really beat the challenge of Africa’s diversity we need many more, young, bright university students to become rice breeders and join hands in the Africa-wide Rice Breeding Task Force. High rice prices in 2007/2008 caused major social unrest in Africa and this is still fresh in people’s memories. As a result of this ‘rice crisis’, African governments (assisted by the international donor community) embarked on ambitious programs to boost their rice production capacity. Five years down the road it seems like a good moment to look at what happened. We analyzed trends in rice production across the African continent, placing particular emphasis on the period before and after the 2007/2008 rice crisis. All data were retrieved from the United States Department of Agriculture (USDA) (www.fas.usda.gov/psdonline/psdQuery.aspx, accessed 7 February 2013). What we discovered was very encouraging. The production growth rate in sub-Saharan Africa increased from 3.2% per year before the rice crisis (2000–2007) to 8.4% per year after the rice crisis (2007–2012). Paddy rice production increased by 2.8 million tons (Mt) from 2000 to 2007, and then accelerated, increasing by 4.7 Mt in the period 2007–2012. Next, we performed a segmented regression analysis on paddy rice yield in SSA over the period 1961 to 2012 partitioned into two intervals: 1961-2007 and again 2007-2012. The analysis shows that rice yield increased by about 11 kg ha-1 per year from 1961 to 2007 (R-squared=0.6) and by a spectacular 108 kg ha-1 per year from 2007 to 2012 (R-squared=0.8), despite two relatively bad years (2011 and 2012) plagued by drought and floods (see graph). Average rice yield jumped by about 30% from 2007 to 2012. Major rice-growing countries contributing to the yield increase after the rice crisis include: Côte d’Ivoire, Ghana, Guinea, Liberia, Madagascar, Mali, Nigeria, Senegal and Sierra Leone. Over the period 2007-2012, 71% of the increase in paddy rice production can be explained by yield increase and 29% by area expansion, whereas before the rice crisis (2000-2007), only 24% of production increase could be attributed to increases in yield and 76% to increases in harvested area. This is very encouraging evidence of increased use of technological innovation after the rice crisis, such as improved varieties and improved crop management in general. In comparison, cereal yields after the Second World War in the UK jumped on average by 78 kg ha-1 per year and in the USA by 50 kg ha-1 per year. Rice yield worldwide, driven by the Green Revolution in Asia, increased by 52 kg ha-1 per year over the period 1960–2010. Rice yields in sub-Saharan Africa are now increasing at a faster rate than the global average. Are these the first signs of a Green Revolution in the making in sub-Saharan Africa, like seen in Asia’s irrigated systems? Average rice yield in sub-Saharan Africa is definitely increasing at a revolutionary rate. However, in contrast to Asia, more than 70% of Africa’s rice is grown under rainfed conditions. A country like Sierra Leone, that has seen a clear increase in average rice yield after the rice crisis has vast areas of upland and inland valley swamps devoted to rice, but no rice is grown under irrigation. 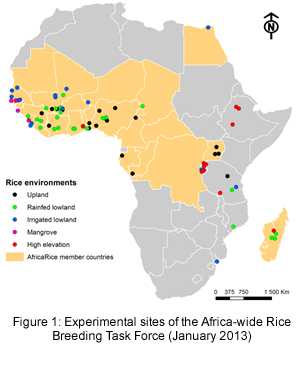 It is also important to note that Africa has already witnessed what could be called ‘mini-Green Revolutions in rice’, in particular in irrigated systems in the Sahelian regions of West Africa. For example, paddy rice yields in the Office du Niger (a large irrigated rice producing area in Mali) increased between 1986 and 1998 from an average 2.5 t ha-1 per year to 6.0 t ha-1 per year, after renovation of irrigation schemes, the introduction of improved varieties and mineral fertilizer and improved crop management in general (including moving from direct-seeded to transplanted systems). A multitude of rice systems in sub-Saharan Africa is, therefore, likely to be responsible for this encouraging trend. It will be very important to study what is happening in more detail. This particular analysis will feature in a forthcoming AfricaRice publication, to be published by CABI, entitled Realizing Africa’s Rice Promise. The results will also be discussed at the Third Africa Rice Congress, being organized by AfricaRice and the Government of Cameroun, to be held in Yaoundé, Cameroun, 21–24 October 2013. Dr. Marco Wopereis holds a PhD degree in tropical agronomy from the Wageningen University, Netherlands. His core areas of expertise are in management of international agricultural research, tropical agronomy and natural resources management, soil fertility and nutrient management, systems analysis and simulation modeling, and participatory learning and action research. Since December 2007, he is the Deputy Director General of AfricaRice and the Center’s Director of Research for Development. AfricaRice is one of the 15 international agricultural research Centers that are members of the CGIAR Consortium. It is also an intergovernmental association of African member countries. Before taking up his current position at AfricaRice he worked at the French Agricultural Research Centre for International Development (CIRAD), the International Center for Soil Fertility and Agricultural Development (IFDC), AfricaRice (ex-WARDA) and the International Rice Research Institute (IRRI). He is member of the scientific council of CIRAD; member of the advisory board of the MSc Program on ‘Agricultural Sciences in the Tropics and Subtropics’, Hohenheim University, Germany; and on the editorial board of several scientific journals. He has authored or co-authored over 150 scientific publications and training and extension materials. He is co-recipient as AfricaRice staff member of the 'Grand Prix du Président de la République du Sénégal pour les Sciences' for the development of the ASI thresher-cleaner, now widely used in Senegal, Mauritania and Mali.